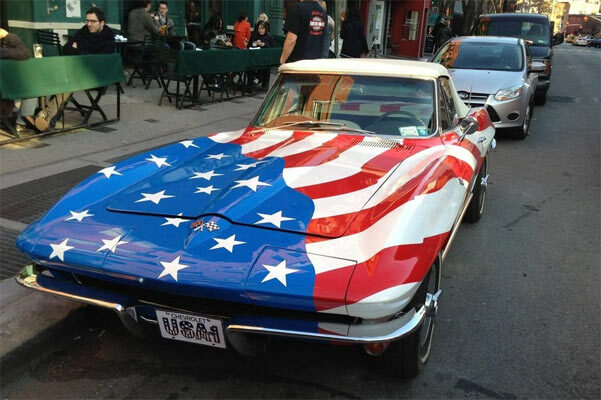 What Is the Most Murican Car? You probably already have an answer in your head. Is it a Corvette? Is it Ford F-150? Is it a Mustang? The answer depends on the year, as it is ever-changing. The index was compiled by Associate Professor Frank DuBois, an expert in global supply chain management, at American University’s Kogod School of Business, he used the criteria below to rank each car. National Highway Traffic Safety Administration AALA “Domestic Content” Score. The 2015 index says that with a total score of 87.5, there are six winners – the Buick Enclave, Cadillac CTS (Coupe), Chevrolet Corvette (auto), Chevrolet Traverse, GMC Acadia and the GMC Acadia Denali. The real answer though is probably more subjective. If I asked you, ‘what is the most French car?’ you may reply, ‘I didn’t think they built them’…… only joking…. The answer may be anything from a Citroen 2CV to some form of Renault, but obviously using the example of France, their automotive output has been huge over the years with many examples to choose from. So, the real answer is what you think is correct and that will be the most Murican Car. Related ItemsWhat Is the Most American Car? ← Previous Story Plasti Dip Your Car – Would You? Fix the hood !!! But nice !!! !